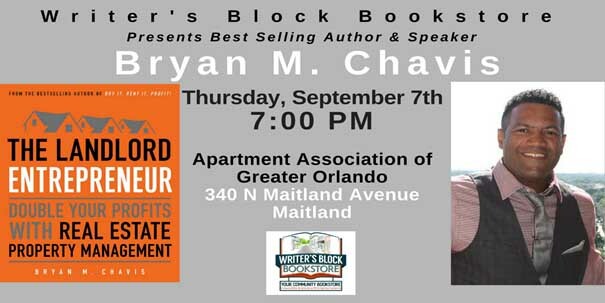 Winter Park, Florida On September 7th at 7:00pm, Writer’s Block Bookstore will host author Bryan M. Chavis at the Apartment Association of Greater Orlando in Maitland, Florida. Bryan M. Chavis will be promoting his latest novel The Landlord Entrepreneur. In his bestseller Buy It, Rent It, Profit! (2009), author and real estate expert Bryan Chavis showed readers how to become successful real estate investors, providing all the forms, facts, and practical advice they needed. In The Landlord Entrepreneur, Chavis builds upon his expert advice to provide an advanced course in property management, demonstrating how to create a business that doesn’t depend on the market or a real estate bubble. About the Book: Using practical advice, anecdotes, and the many lessons learned while creating his multimillion-dollar real estate portfolio, Chavis walks readers through the process of building a property management business from scratch. The Landlord Entrepreneur explains the importance of calling yourself an entrepreneur, and not simply a real estate agent, and shares stories of some of the many people who have taken his guidance and built successful companies. With its straightforward, actionable advice, The Landlord Entrepreneur is sure to be a key tool for any aspiring real estate investor. About the Author: Bryan Chavis is the founder of both The Landlord Property Management Academy and of Chavis Realty and Property Management 365 Franchise, which is one of the most innovative property management franchises available. One of the world’s leading property management consultants, he (and his company) received the 2016 Best Practice award from the Florida Association of Housing and Redevelopment Officials for landlord/property management training. A community bookstore in your neighborhood. We have been located off of Park Ave for almost two years and have been bringing your favorite authors into town. We curate our stock based on the community’s wants and needs, but always have the latest releases. We have your favorite book.